If you like matcha and if you like white chocolate, combine the two and make this Matcha Green Tea White Chocolate! It’s earthy from the matcha yet sweet and delicious from the white chocolate. This is the ultimate treat — and it’s secretly sugar free, low carb, and gluten free too! Matcha + White Chocolate + Desserts with Benefits = BEST DESSERT EVER! This homemade Matcha White Chocolate will melt in your mouth. I adapted this recipe from the Homemade White Chocolate recipe in my Naughty or Nice Cookbook. Instead of using a base made up entirely of cacao butter, which can be too firm and “snap” like dark chocolate when broken, I used a mixture of half cacao butter, half Homemade Macadamia Butter. Because white chocolate is supposed to be soft where your teeth sink straight through. For an all-natural sweetness without the refined sugar (and excess calories and high glycemic index), I used a mixture of erythritol and stevia. For some pretty vanilla bean flecks, I added a bit of my Homemade Vanilla Paste. Alternatively, you can scrape the seeds out of half a real vanilla bean if you like! If you like matcha and if you like white chocolate, combine the two to make this creamy, sweet, and delicious Matcha Green Tea White Chocolate! While the water heats up, add the nut butter, cacao butter, and vanilla paste into the double boiler insert. When the water starts to simmer, reduce the heat to medium-low. Whisk occasionally until completely melted. Turn the stove off. In a small bowl, whisk together the erythritol, dried milk, matcha, and salt. Slowly whisk this into the stovetop mixture. Whisk in the stevia extract (it will thicken). Spoon the mixture into chocolate bar molds. Refrigerate until firm. Store in a tightly sealed container in the fridge (keeps for ~1 month). 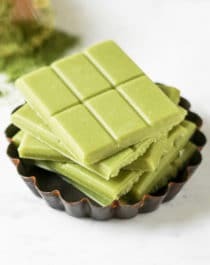 Compared to 1oz of regular, storebought white chocolate, this Healthy Matcha White Chocolate has fewer calories and a lot less sugar (anywhere from 15-18g less). Well YES, I’ll take that!